3D Slicing Software is important for semi-automated rendering of 2D images to 3D structures for surgical sciences. Cloud Servers can provide the needed computing power. As practically we published before, today in the Open Source World, two different categories of scientists and inventors are emerging in applied health sciences. First belong to the closed source model, where there is no way to really know how the whole process is going on. The second category of peoples consists of really knowledgeable group of peoples – the earned traditional degree is of secondary importance when it is about real development. We wrote about these philosophies and real developments in projects like Open Source Pacemaker. If you closely think, today Health is slowly going towards Open Source model, just imagine the progress of Wikipedia to distribute free, reliable data on health. Now, gradually these Open Source minded peoples are setting the Standards in IEEE, W3C like places to make the progress easier. But, the motto of this article is not to discuss about the philosophy of GNU GPL but to discuss about 3D Slicing Software, Rendering and Cloud Computing. Cloud Computing, unfortunately is not accepted by Richard Stallman – we published in the article Richard Stallman’s view on Cloud Computing and Ubuntu. Definitely, Cloud Computing in a vendor locked system like served by Google, Microsoft etc. companies are not great, but the Open Source Cloud Computing platforms are such safer. The reason Cloud Computing is becoming important in Health Sciences is because of the on demand, cheap easy to use remote desktop – be it as desktop as a service or as Virtual Computing Network. Unless this small introduction is provided, it will be difficult for the reader to understand, what we are going to talk about and most importantly why we are talking about! 3D Slicing Software is a big group of various functioning softwares. All belongs to Scientific visualization. 3D Slicer is itself a name for a free open source software for image analysis and visualization. 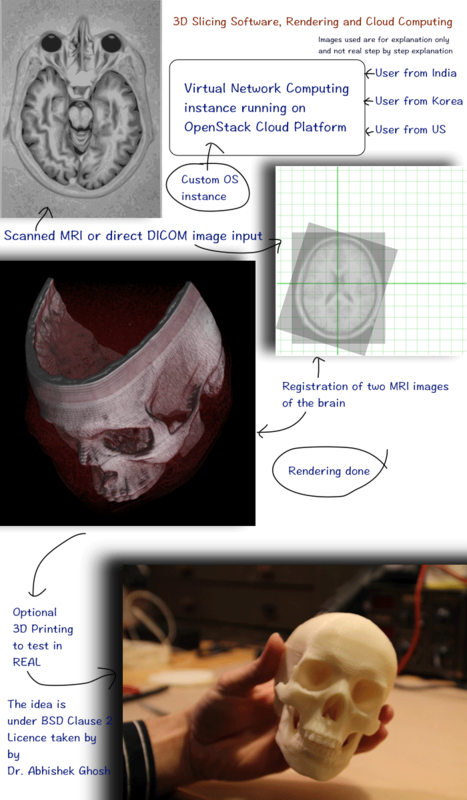 Volume rendering is the method we use to render images to 3D from 2D images obtained from CT or MRI. Image registration is the process of transforming different sets of data into one coordinate system. In Medical image registration, data of the same patient taken at different points in time such as change detection or tumor monitoring and often additionally involves elastic registration to cope with deformation of the subject (due to anatomical changes). Nonrigid registration of medical images can also be used to register a patient’s data to an anatomical atlas. Now, readers will expect a list of some softwares or packages which can be used on Linux/UNIX systems. As rendering can be quite processor intensive work, we might need multiple virtual CPUs in an instance to handle the load. CAELinux is a great bootable deb based custom Linux and as we know, we can use boot custom OS on Rackspace Cloud. Instead of listing the softwares here as they will update the list. This Article Has Been Shared 9442 Times! Website With Rackspace Cloud Files Really Costs in Cents – You Can Create a Sales Website, Your Photography Website, Profile Website at Absolutely Cheaper Cost. Databases in the Cloud can be the foundation of almost all web applications of a company and thus have an essential importance for its success. Tips for safe construction of Hybrid Cloud focuses on the solution on a specified cloud management system which connects the private with the public cloud. Cite this article as: Abhishek Ghosh, "3D Slicing Software, Rendering and Cloud Computing," in The Customize Windows, July 5, 2014, April 26, 2019, https://thecustomizewindows.com/2014/07/3d-slicing-software-rendering-and-cloud-computing/.